Many mesothelioma patients are afraid that dieticians will put them on a strict diet, but usually, this is not the case. 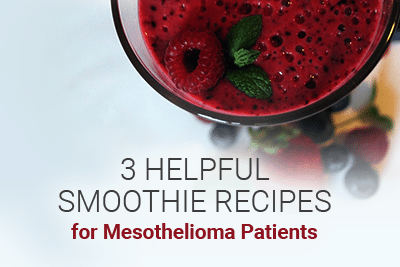 At Mesothelioma Guide, we have gathered a few dietitian approved recipes for smoothies that we feel can help mesothelioma warriors along their medical journey. During treatment, many patients experience a loss of appetite. If this occurs, patients are encouraged to eat several snacks throughout the day, rather than eating 3 large meals.Patients may experience a sore mouth or throat during certain treatments, such as chemotherapy. They may also find themselves having difficulty swallowing. This Chocolate Banana Smoothie recipe, from the University of Michigan Comprehensive Cancer Center, would be a great nutritious snack option. This smoothie could also help soothe a patient’s sore throat. In a blender layer the banana pieces, soy milk, and cinnamon. Next, blend the ingredients until smooth. Serve and drink immediately. On Mesothelioma Guide’s recent visit to Baylor St. Luke’s Medical Center, we learned that mesothelioma specialist, Dr. David Sugarbaker, values meal plans that are high in protein for his patients.Cheryl Bixby, a dietician that works on Dr. Sugarbaker’s team, explained that having a diet high in protein helps prepare mesothelioma patients for surgical procedures. Protein helps build and repair tissues inside your body. “If you’re not eating well before surgery and not getting all the protein you need to heal and repair, it’s not likely you’re going to be able to do that after surgery either,” Bixby said. This Tangy Protein Smoothie recipe comes from the American Cancer Society. It is packed full of protein that can help strengthen a patient’s body before, during, and after treatment. In a blender combine all of the ingredients and blend on high until smooth. Make sure that you chill this smoothie mixture before you serve it. Researchers believe that vitamin antioxidants may help prevent cancer. Since cancer survivors may be at a risk for developing new cancers, they are encouraged to eat a variety of fruits and vegetables that are high in antioxidants. One way that you can supply your body with antioxidants is by drinking this green smoothie. This recipe comes from the Mayo Clinic and is high in antioxidant vitamins A and C.
Vitamin A plays an important role in supporting cell growth and differentiation. Vitamin C helps protect our bodies against immune system deficiencies. In a blender combine all of the ingredients and blend on high until smooth. This recipe will provide you with 4 servings. Nutrition During Cancer Treatment. MOFFITT Cancer Center. Retrieved from: https://moffitt.org/patient-family/healing-wellness/nutrition/nutrition-during-cancer-treatment/. Accessed: 06/26/2017. Recipes. Comprehensive Cancer Center Michigan Medicine. Retrieved from: http://www.mcancer.org/support/symptoms-and-side-effects/cancer-nutrition-services/recipes. Accessed: 06/26/2017. Appetite changes. American Cancer Society. Retrieved from: https://www.cancer.org/treatment/survivorship-during-and-after-treatment/staying-active/nutrition/nutrition-during-treatment/poor-appetite.html. Accessed: 06/26/2017. Healthy Recipes Recipe: Green smoothie. MAYO CLINIC. Retrieved from: http://www.mayoclinic.org/healthy-lifestyle/recipes/green-smoothie/rcp-20049958. Accessed: 06/26/2017. Recipes to try during cancer treatment. American Cancer Society. Retrieved from: https://www.cancer.org/treatment/survivorship-during-and-after-treatment/staying-active/nutrition/nutrition-during-treatment/recipes.html. Accessed: 06/26/2017. The Benefits of Protein. WebMD. Retrieved from: http://www.webmd.com/men/features/benefits-protein. Accessed: 06/26/2017. Vitamin A Fact Sheet for Health Professionals. National Institutes of Health. Retrieved from: https://ods.od.nih.gov/factsheets/VitaminA-HealthProfessional/. Accessed: 06/26/2017. The Benefits of Vitamin C. WebMD. Retrieved from: http://www.webmd.com/diet/features/the-benefits-of-vitamin-c#1. Accessed: 06/26/2017. Vitamin C Benefits. WEIL. Retrieved from: https://www.drweil.com/vitamins-supplements-herbs/vitamins/vitamin-c-benefits/. Accessed: 06/26/2017. American Cancer Society. Nutrition and Physical Activity During and After Cancer Treatment: Answers to Common Questions. Retrieved from: https://www.cancer.org/treatment/survivorship-during-and-after-treatment/staying-active/nutrition/nutrition-and-physical-activity-during-and-after-cancer-treatment.html. Accessed: 06/26/2017.